Oriental Medicine - Natural Medicine inc. Traditional Oriental Medicine is composed of 5 branches or areas of therapy. These five branches constitute the mosaic of human health and well being, and are exemplified as the harmonious interaction between the Cosmos (Heaven), Earth and Human Beings. 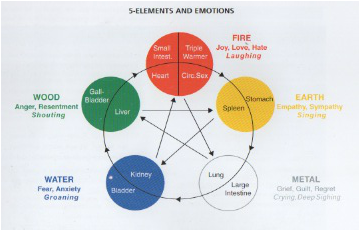 The Five Branch modalities influence all dimensions of human activity. The Five branches are: Nutrition, Exercise, Massage, Acupuncture, and Meditation. Together, these five branches allow a person to regulate and harmonize the three aspects of Humanity; Body, Mind, and Spirit (Jing, Qi, and Shen). The five branches each contain many techniques to help establish and maintain a balanced life, which results in radiant health. Notice that three of the modalities are lifestyle factors (i.e. nutrition, exercise, and meditation. The five branches are further explained below. Nutrition- The traditional modality of nutrition includes advice for a balanced diet, as well as the application of specific herbs/supplements as support for clinically significant disorders. Also traditional oriental medicine can give insights as to which foods (or spices) may be beneficial or counterproductive to specific illnesses. Exercise- In traditional oriental medicine there are to types of exercise: hard & soft. Hard exercises are characterized as exercises which focus primarily on the external body parts (ex muscles, tendons, cardio-vascular system), such as weight lifting, interval training, cardio conditioning, running etc. Soft exercises are often characterized by slower more purposeful movements designed to improve joint mobility, range of motion, longevity, balance, or vital energy. Examples include Walking, Stretching, Tai Qi, Qi Gung, & Low impact exercises. While both forms of exercise are beneficial, each individual may need more of one than the other, or may need to strike a balance between the two. Exercise must be appropriate to the individual. Massage- often called Tui Na "push,pull", or acupressure, massage is an integral part of oriental medicine as its function is to increase blood and energy circulation throughout the system or its affected parts. As mentioned above "Push, Pull" refers to the oriental method of stretching and massaging. This type of therapy can be beneficial to stiff, sore muscles, and joints. Meditation- is the "mind coming home to rest". Meditation can give the mind a chance to relax. Concentration can be increased, and a healthy attitude can be maintained.